Dr. Callotta is available for speaking engagements on a wide variety of health topics. She can do a single presentation, or a series of talks to address current health and wellness issues. Talks can be presented during a lunch hour, or delivered during longer, more involved discussions with multiple topics and speakers. Her discussions can be extremely beneficial to your employees and team members. They also contribute to productivity in the workplace by motivating employees and creating a healthier and happier environment. 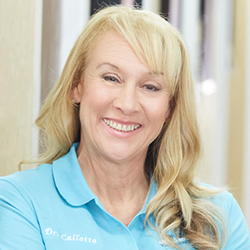 Schedule Dr. Callotta as a speaker for your next event!. Do you have a business, team, group, club or organization that would benefit from a health and wellness discussion? Are you in a non-profit group or church looking for great topics, or know someone who is? Would you like to help your employees with body aches and pains from long days at their work stations? Would you like to prevent work injuries? Do your workers do manual labor? Is your service organization looking for lunch time speakers? Hydration: Good hydration means getting the right amount of water and electrolytes before, during, and after exercise. Water regulates your body temperature, lubricates your joints and controls your blood pressure. It helps transport nutrients to give you energy and keep you healthy. If you’re not hydrated, your body can’t perform at its highest level. Learn how to stay hydrated to combat fatigue, dizziness, muscle cramps and other serious symptoms. Injury Prevention: We provide guidance to help athletes fight off injuries. In addition, we also provide resources to help employees avoid work-related injuries. Not all injuries can be avoided, but the severity and probability of injury can be reduced through proper conditioning, training routines and good sportsmanship, making the sport/activity safer for all who participate. Handling the Stress Monster: How do you handle the stress monster? What can you do to help keep things in perspective? Learn various techniques to successfully keep stress under control in your busy life. Activities discussed include deep breathing, progressive relaxation and positive imagery. Kinesio Taping Made Easy: Kinesio Taping Method (KTM) is a therapeutic taping technique that offers patients and athletes the support needed to get through their daily activity or sports event, while helping to rehabilitate conditions and injuries. Kinesio taping may be used on populations ranging from pediatric to geriatric to treat many clinical conditions. The tape can be applied in hundreds of ways. We provide guidance on how to use kinesio tape and explain how this technique assists in supporting the body’s optimal functionality. Oh! My Aching Head: Headaches are not normal! Learn about the most common causes of headaches and what you can do to avoid and manage them. You don’t have to live with the pain. Oh! My Aching Back: Back pain is the second most common reason why people consult doctors these days. If you are one of those people who live with back pain, you have many options available to you. Learn what you can do to avoid some of the most common back issues facing people today, and learn to take control of the situation. How to Give an Effective Massage: The art of massage has been around for centuries. It can be beneficial for relaxation, stress and injury recovery. Learn some basic tips on how you can give an effective home massage. Wrist Rescue: One of the most over used parts of our bodies are our wrists. They can often take the brunt of wear and impact from our many activities, creating issues such as carpal tunnel syndrome and tenosynovitis. Learn what you can do to manage wrist pain and irritation. Healthy Feet Feel Really Neat: Your feet are the foundation of your body. When they hurt, “everything hurts”. See what you can do to address some of the most common foot issues facing people today. Be Nice To Your Knees: Be nice to your knees…you’ll miss them when they are gone, and knee replacements are increasing! The knee joint is one of the most complicated and most relied-upon joints in your body. Much can be done to keep them healthy and functioning. You “kneed” to know this. You Are What You Eat: Diet and nutrition are the fundamentals of our survival. Eating the right foods (or more importantly avoiding the wrong foods) can make a difference in not only the longevity, but also the quality of your life and how good you feel on a daily basis. Check out some basic dietary “dos and don’ts” to keep yourself healthy and active. Fibromyalgia – An Unknown Disease: A widespread, but little known connective tissue condition, Fibromyalgia affects millions of people in our country. Learn what it is and what you can do to manage the symptoms associated with it. Blood Pressure and Cholesterol Control – Naturally: Let us teach you how to make healthier choices, and to engage a natural and holistic approach to addressing high blood pressure and cholesterol. Learn which lifestyle options can make a big difference. You have more control that you think. Top 10 Things You Can Do to Improve Your Health: The little things can make a big difference. Hear a fun and informational talk on basics you can address to keep your mind and body happy, healthy, and active— at any age.